Project managers may struggle with seeing clearly and quickly what their team is doing at any given point in the project schedule. Project managers may also struggle with finding a quick and painless way to do something about problems that they discover. Note: Team Planner is a feature available only with Project Professional. Welcome to the Team Planner, a feature that gives project managers greater visibility into, and control over, their team's work. On the View tab, in the Resource Views group, choose Team Planner. The Team Planner appears. One row is displayed for each resource in the project. On the left, resource names appear. All of the tasks that a resource is assigned to appear on the same row on the right. Resource tasks that don't have a start date or end date also appear on the left next to the resource name. Tasks that are not assigned to anyone appear at the bottom. Tip: If you use agile project management as your organization's project scheduling methodology, use the unassigned tasks as your "backlog" of tasks that are waiting to be assigned to resources in future sprints. 1. A completed task. This task is a completed task with 100 percent actual work. It cannot be moved using Team Planner. 2. Two tasks assigned to same person. The top task is automatically scheduled and partially completed (indicated by the color change on the bar). The bottom task is manually scheduled. Both are scheduled at the same time to the same person. The resulting overallocation is indicated by red lines. Either of these tasks can be moved to a different time in the schedule (or to a different person) to resolve the overallocation. 3. An unscheduled task. This task is assigned to a specific person, but it doesn't have enough scheduling information to become a scheduled task. For a task to be scheduled (and thus move to the right side of the view), it has to have at least two of the schedule settings set. For example, if the duration and start date is set (but no finish date), the finish date will be automatically set and it will become a scheduled task. Similarly, if it has a start date and end date set (but no duration), it will also become a scheduled task. If only the start date is set, it will remain an unscheduled task. 4. Unassigned tasks. This task has not been assigned to anyone. It can be assigned by dragging it to a person's schedule in the right section. To keep the task unscheduled but assigned to a person, drag it vertically to a person's name in the upper-left section. 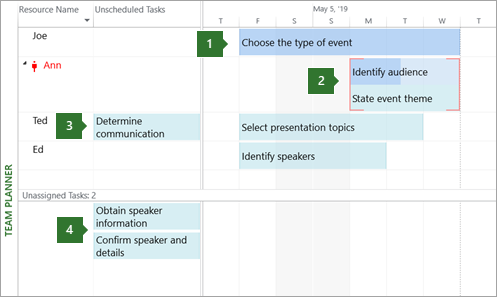 Tip: The color of the task gives you useful information about its scheduling state. For example, portions of the bar that are darker blue indicate actual work. Green tasks are manually scheduled. There are different reasons why you might want to move a task. Someone might be assigned too much work, or perhaps you want to reassign work to a different person. Or maybe you discover that no one is working on an important task. Team Planner will handle all of these problems, and much more. Using Team Planner, rescheduling a task is as simple as dragging it somewhere else. 1. Moving a task vertically to resolve an overallocation. You can move tasks for a resource that is working on two tasks at the same time. 2. Moving a task vertically to assign new work to a person. Work that is not assigned to a person can be assigned to someone by dragging and dropping. 3. Moving a task horizontally. A task can be scheduled to worked on at a later time in a person's schedule. Here are other ways you can use the Team Planner. A person's nonworking time will appear as gray vertical bars. Double-click the vertical bars to see more details about the nonworking time. To get a higher level of detail about task and project information, roll up information on Team Planner. On the Format tab, in the Format group, select the level of detail by choosing Roll-up and then an outline level. When tasks are rolled up, the highest-level task will appear as a single bar. Hold down CTRL while clicking multiple resource or task names. You can also drag the mouse over multiple items to select them. You can navigate through items in Team Planner using the arrows keys. To move a highlighted task, use CTRL + arrow. To scroll the view, use ALT + arrow. Dragging a task to the edge of the Team Planner will automatically cause the view to scroll. In this way, you can drag a task further into the future (or past) without having to release the mouse button. Hover over a task to read important and useful information about how it is being scheduled. Tooltips can help you make important scheduling decisions. 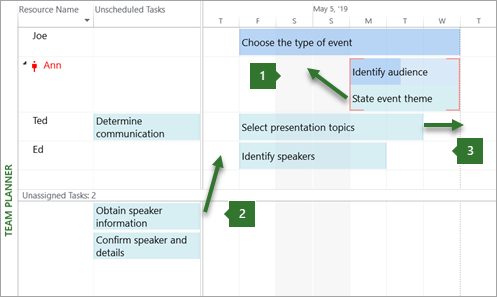 Assuming you've read other sections in this article, you are now fairly familiar with how to move tasks in the Team Planner. Most things you can do in the Gantt Chart and other views you can do in the Team Planner as well. This section covers other things you can do in the Team Planner to get more done in less time. To change a task from being automatically scheduled to manually scheduled, right click a task, and then select Auto Schedule or Manually Schedule. On the Format tab, choose Prevent Overallocations. When this setting is on, if moving one task would create a conflict with another, the second task will be automatically moved to prevent any overallocations. Right-click the task bar to choose Inactivate Task. Inactivating a task doesn't delete it from the project, even though the task will disappear from the Team Planner. It does prevent the task from having actuals reported on it. The easiest way to reassign a task is by dragging it to another person. You can also right-click a task, and then click Reassign To. This is especially useful if you want to maintain the same dates. To change the name of the task or other properties (such as constraint type outline codes, deadline dates, or task types), double-click the task. You can also double-click the resource name to view and change resource information. For advanced project managers who are comfortable with the traditional split (or combination) view, you can show more details in a separate bottom pane. On the Task tab, in the Properties group, select Display Task Details. The bottom pain displays detailed information about the selected task and resources assigned to the task. Note: You cannot use a timescaled view, such as the Resource Usage or Task Usage views, along with Team Planner in a combination view. To view a timescaled view along with Team Planner, open a new window, and then arrange the windows horizontally. To do this, on the View tab, in the Window group, choose Arrange All. You can change the way the Team Planner appears to suit your needs and to make the view more attractive. On the Format tab in the Styles group, pick the bar type you want to change, and then select either Border Color or Fill Color. Individual bars can also be modified. On the Format tab in the Format group, select a number of lines using the Text Lines list. Use the Zoom Slider in the lower-right part of the Project window to change how much time is displayed in the right side of the view. Right-click in a blank area of the right side of the view (not on a task), and then choose Nonworking Time. Choose the down arrow on the Resource Name column, and then select Sort, Group, or Filters for defined or custom filters. You can hide the columns for unscheduled and unassigned tasks. On the Format tab in the Show/Hide group, select the type of column you want to show or hide from view. Drag the vertical and horizontal borders between the sections to change the size of the sections. Tip: If you've customized the Team Planner considerably, you can save a version of the customized view into a separate view. On the View tab, in the Resource Views group, select the bottom half of the Team Planner button, and then choose Save View.